This article was originally published in Warship International No. 2, 1979 and is reproduced here by their kind permission. The retirement of the Canarias was likewise a milestone in the history of fighting ships, for she was the las of the "Washington" cruisers in active service, the end of an extensive line of ships of many maritime nations designed to meet the requirements of the naval limitation treaties of the interwar years. I. The Origins of the Canarias. 1. Strategy and Fleet Development. Spain's economic and political weakness, combined with her geographical position on the crossroads of world maritime trade, have in recent centuries consigned her to a frequent role as victim of great power rivalries. A special Spanish fear concerned the integrity of Spanish island provinces. France or her enemies might seize the Balearic Islands which lie athwart the strategic route linking France and Algeria. Similarly the Canary Islands guard the path from Europe to West Africa and the South Atlantic, a trade route crucial to both France and Britain or their enemies. That these island provinces might become tempting targets for foreign seizure, as Menorca in the Balearics had once become, and as Gibraltar remained a living example, haunted Spanish political and strategic thinking in modern times. The Spanish Navy had been incapable of defending overseas possessions in 1898, and for the next decades there was some confusion as to how best to rebuild the fleet, defend Spanish shores and islands, and to protect Spanish commerce. Small dreadnought battIeships and torpedo boats were the first of the new navy off the ways and were followed by cruisers, destroyers, and submarines, incorporating the lessons of World War I, to form a balanced fleet on contemporary lines. In the decade and a half following the war, Spanish strategic writings and fleet exercises concentrated on the close defense of home waters, and particularly the Balearics and Canaries. Cruisers could additionally show the flag, convoy Spanish merchant ships in the event of another European war (belligerants having sunk 68 in World War I), and if Spain herself was embroiled, engage in a wide-ranging campaign against enemy trade routes as "guerrilleros del mar." The existing Spanish cruisers of the 1920s were no match for the 10,000 ton, 8-inch gunned, treaty cruisers being built abroad. Even the sleek, new, Principe Alfonso class lacked adequate firepower (eight-152mm [6in.] guns) for a fleet action, and endurance (5,000 miles at 15 kts) for a guerre de course without overseas bases. The next generation of cruisers would have to do better. At the 1924 League of Nations disarmament negotiations in Rome, Spain accepted an individual upper limit for her new construction of 10,000 ton as a concession in hopes of attaining a greater permissible total tonnage for her fleet. Of course, no treaty was ever signed extending the principIes of the Washington Treaty to smaller naval powers, but Spain framed her building plans with a possible treaty in mind. She then participated in the worldwide obsession of building up to treaty limits. Thus when the king on 14 July 1926 approved new naval estimates, they included 268,500,000 pesetas for building and outfitting two 10,000-ton cruisers as welI as a variety of smaller warships. The 1926 program was ambitious, especially considering the weakness of the Spanish economy and building costs double those of Britain. The advantages of Spanish-built ships were in keeping Spanish marine engineering and shipbuilding skills up to date, and providing employment for Spanish workmen. The order for the new cruisers went to the yard most capable of building large warships, the Sociedad Española de Construcción Naval (SECN) of El Ferrol. This company was largely British owned, but it brought money and the most recent British technology and designs into Spain. Modem Spanish warships had all been improvements of proved British designs, keeping Spain in the running while minimizing design costs. The new 10,000 tonners would continue the pattern. The new cruisers were designed by Sir Philip Watts as a modification of the British "County" class of Sir Eustace Tennyson d'Eyncourt, then under construction for the Royal Navy. Watts took a holder approach than did Sir William Berry with his London-Dorsetshire groups of the "County" class being developed at the same time. Design requirements originated in the 1921 Washington Treaty cruiser limits of 10,000 tons standard displacement and 203mm [8in.] guns. All the treaty powers, led by the Japanese, quickly adopted these maximums as their standard. 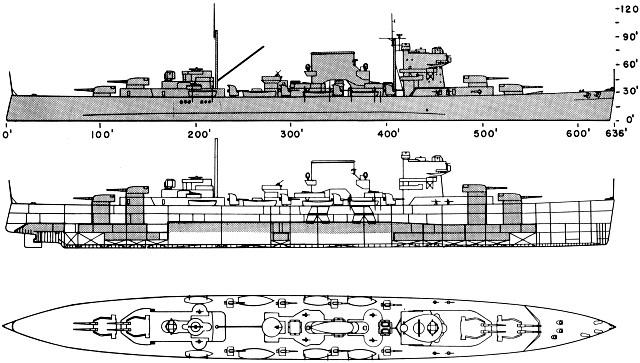 The British AdmiraIty had preferred to expend limited funds on a larger number of smaIler 6in.-gunned cruisers, but for a time concluded that the 10,000-ton hull was necessary to ship an adequate number of 8in. guns to match Japanese and American counterparts. Italy and France did the same. A technological arms race by treaty was under way. The "County" design sacrificed almost all protection to mount eight-8in. guns on a 32 kt platform. A long but strongly framed and plated hulI aided the 80,000 shaft horsepower powerplant in maintaining speed, and a high freeboard on a flush-decked hull increased habitability and allowed high-speed endurance in all weather conditions. Eight boilers were ranged forward, separated from the four geared turbines by an intervening magazine. A protected deck supplemented by a set of armored magazine box citadels and thin gun-houses, barbettes, and belt, aIong with externaI bulges, was alI the protection possible for the Kent group, the first of the "County" class. Watts did not modify these basic features, except to increase the powerplant by 10,000 SHP and gain an extra knot. He kept the external bulges, whereas Berry in the London group developed internaI torpedo protection and thereby an extra knot. The Kent group had suffered blast effects on the bridge when turret two was fired abaft the beam. Berry moved the bridge of London aft whereas Watts raised the bridge of the Spanish cruisers one deck. In contrast to the three raked funnels in the Kent, Watts planned to trunk the boiler uptakes into two vertical funnels directly over each four-boiler grouping.2 The project called for a catapult and two observation aircraft immediately abaft the funnels. This design, except for the spacing of the funnels and the location of the catapult, foreshadows the London herself as rebuilt in 1938-41. The Spanish heavy cruisers harbored all the vulnerability of "tin-clad" treaty cruisers, but they easily stood beside or ahead of any heavy cruiser the British could put up. They were a match for the French Tourville and Suffren classes and the Italian Trenta class, and had far better endurance. The more recent French Algérie and the Italian Zara and Bolzano classes enjoyed better protection, but other characteristics were similar, and they would have been a close match in a cruiser duel. Only the newer Japanese and American designs were clearly superior. The British "County" type Treaty heavy cruiser Suffolk (1936-1948), photographed at Hong Kong naval base in late January 1931. Official U.S. Navy Photograph NH 52144, the original print being transferred from the Office of Naval Intelligence at about the end of World War II to the Naval Historical Center (NHC). Partial views of Kent taken at the same place include NH 52109-52110. The stern of U.S.S. Isabel (PY 10), an Asiatic Fleet gunboat (ex-yacht), appears to the left. The "County" class cruisers provided the basic origin of the design for the Canarias and Baleares. Spain accepted the Watts design two years after the project had been approved, the orders being placed with the SECN, El Ferrol, on 31 March 1928. The two ships were designated as "rapid cruisers" No. 12 and 14, appropriately receiving the names Canarias and Baleares after the two archipelagos the Spanish Navy was committed to defend. The Marques de Estella presided as the keels of the two sisters were laid on the same day, 15 August 1928. Construction progressed slowly, partially for financial reasons, and Canarias was not launched until 28 May 1931, Baleares sliding down the ways a year later, 20 April 1932. Two stages in the installation of the main battery turrets, in this case turret four of Baleares. Photos GF. Construction of Canarias and her sister continued at a sluggish pace, and labor disputes put the uncompleted ships increasingly behind schedule and the times. The quality of materials and workmanship, however, was excellent, and, aside from the armor plate and some precision equipment, all of Spanish origin. Canarias ran her sea trials from 18 July to 27 September 1934, when she was still without her after turrets. Following these trials, a new open command bridge was constructed on the 3rd bridge level [US: 04 level] immediately above the navigational bridge. When the Spanish Civil War broke out in July 1936, Canarias was still lacking all secondary armament, all her fire control equipment, and her catapult. At that moment Baleares was even further behind, with the fore turrets just installed. The missing guns for both were caught far across the war-enveloped country. Their fire control equipment and catapults were still on order in Britain and Holland. Nevertheless the demands of war would tolerate no delay, and both vessels entered a most hectic period of fitting out for combat. The international code signal assigned for Canarias was EBAH and for Baleares EBAI. 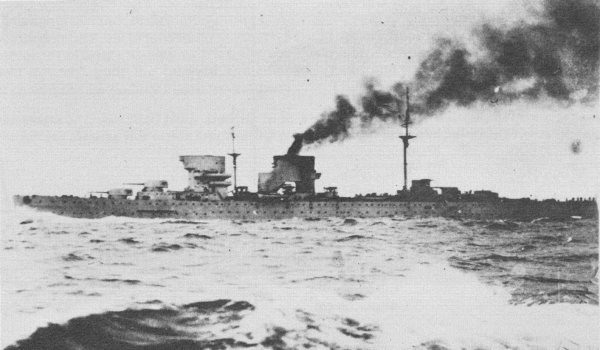 Canarias on sea trials in the summer of 1934. Note the original bridge configuration, the fore topmast soon to be struck, and the absence of the after turrets. Photo: Casaú, Cartagena. The dimensions paralleled the London group closely, the Canarias being slightly longer and less of beam. Trial displacement was 10,617 tons. Full load displacement was recorded at only 12,230 tons in 1936, in part due to the fact that the catapult and aircraft were never shipped. Full load displacement by 1975 had risen to 13,969.9 metric tons. An additionaI 27 tons of weight would raise the waterline one centimeter. As a seaworthy vessel, the hull design was a success. Canarias was heavily framed, with a spacing of 610mm (24in. ), except forward of frame 26 and aft of frame 264, that is, 4.58m (15ft.) forward and aft of the turrets, where spacing was 915mm (36in.). 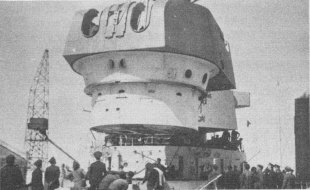 Transverse bulkheads and the platform deck utilized 12.5mm (.49in.) steel, and longitudinaI bulkheads 9mm (.35in.). Two rows of stanchions on each deck aided structural strength. Skin plating employed 19-22mm (.74-.87in.) in-and-out strakes. The double bottom was continuous between frames 84 and 218 (machinery spaces), with a height of 1145mm (45.08in. ), and wrapped up the sides until it met the inclined protected deck. There were a total of 292 compartments. Hull lines curved toward the bow and stern in the gentle sweep of a foil huIl. The high freeboard of over 6.5m (21ft.) tended to mask the sleek lines of the hull, which had a block coefficient of .5513 at a mean draft of 5.28m (17.31ft.). The bow raked at a constant 10º angle and mounted a cast steel forefoot and stem up to the platform deck. The cruiser stern, only slightly rounded, raked forward at a similar angle. The sheer of the bow at the upper [US: main] deck was 1.67m (5.48ft.) and at the stern .51m (1.67ft.). The sides amidships flared outboard about 10º. An obvious knuckle ran along the main [US: 2nd] deck from No. 1 turret to the bow. 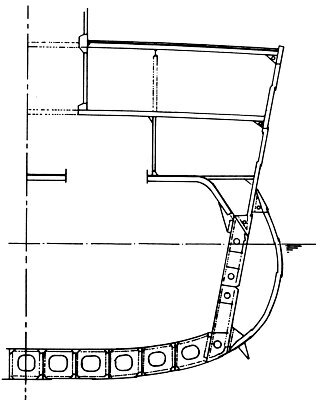 Enlarged midship cross section (GL). Tracing by William A. Becker. Transverse stability was quite adequate with a metacentric height (GMT) of 1.3m (4.27ft.) at full load. The maximum righting arm (GZ) was 1.54m (5.05ft.) at a 53º list. Stability only became negative after 90°. The longitudinal metacentric height was a comfortable 412m (1352ft.). Moment to change trim one centimeter was 299.12 meter-tons, the trimming axis on a center of flotation of 8.24m. There were three distinct deckhouses, the midships deckhouse being bisected by a thwartships passage between funnel trunks. The bridge structure towered four levels above the forward deckhouse. As originally constructed, Canarias sported two steel polemasts with wooden topmasts, the main being taller than the fore. The scanty protection afforded the Canarias class clearly marked them as "tin-clads," although protection was better than many foreign "paper-clads" of the first generation. There was little weight available for armor, given gun and speed requirements, in a 10,000-ton hull. Top priority went to magazine protection against light bombs and shells. The belt, protected deck, and gunhouses were too thin to provide much more than light ordnance and splinter protection. The class remained vulnerable to attacks by destroyers and armed merchant cruisers as well as from the air. This armor closely matched that of the earlier units of the "County" class. The Spanish ships, however, had a half inch less plating on the fore end of the forward magazine and only a 2-inch belt. The early "County" class boasted a graduated belt of 5.5 inches (upper) to 1 inch (lower), but the later units had to make do with only a 1 inch belt. The "County" turret faces and roofs were 2 inches, twice that of Canarias. The Canarias class enjoyed a superior element of armor only with their after citadel ends twice that of the "Counties" and .5-inch thicker transversal bulkheads joining belt ends. At midships, the external bulge extended aver 2m (6.6ft.) above the waterline and extended beyond the protective deck slopes. The bulge joined the double bottom 4m (13.1ft.) below the waterline. The encIosed void extended as much as 1.3m (4.3ft.) from the side plating. The number of watertight transversal bulkheads reaching the platform deck was 23, and respectively 20 to the lower [US:3rd] deck, 14 to the main [US: 2nd] deck, and 12 all the way to the upper [US:main] deck. The fraility of this protection was forcefully demonstrated by the explosion of the forward magazines of the Baleares by a torpedo in 1938, a weakness inherent in the cruiser type, and only exacerbated by treaty requirements. Simplified arrangement of armor. U.S. Navy drawing from Arthur D. Baker III Collection. Errors in the original drawing reproduced here include showing side armor over steering gear (whited out here) and failure to show wheelhouse armor. Simplified recognition drawings of Canarias. U.S. Navy Official courtesy A. D. Bakker III Collection. Eight Yarrow-Admiralty 60 boilers were arranged two each in boiler rooms A and C, and four in boiler room B, the three rooms having a total length of 31.75m (104ft.). 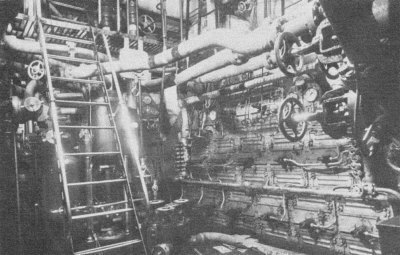 The oil-fired boilers were three-drum, with 13 burners each. The volume of the combustion chamber was 269m² (2,895ft.²) and the heating surface, incIuding superheaters, 6,875m² (74,002ft.²). Steam pressure was 17kgs/cm² (242 lbs/in²). Four Parsons geared turbines were paired in two engine rooms extending 32.94m (108ft.). The forward turbines were mounted outboard of the others and drove the outboard of four screws.7 Each HP turbine was coupled in series with its LP turbine, with a reverse turbine incorporated in the same casing as the LP turbine. Steam pressure was 14kgs/cm² (1991lbs/in²). HP turbines developed 2750rpm, the LPs 1950 rpm. Designed shaft horsepower was 90,000, although 94,617shp was possible. Designed shaft rpm were forward 300, reverse 200. One of the Yarrow boilers in Canarias. The 13 burners are visible. Photo: GF. Each of four screws was a three-blade, wide-tip, single casting of magnesium bronze with a diameter of 3.505m (11.5ft.) and an area of 6,021m² (64.81ft.²). The rudder was semi-balanced with an area of 17.8m² (191.5ft.²). Electric power was provided by three turbogenerators of 300kw, three diesel generators of 100kw, and one diesel generator of 35kw. Electrical service was 220v. Auxiliary machinery incIuded a windlass, a steam capstan forward, an electric capstan aft, and eight electric winches (4-1 ton, 2-2 ton, and 2-6 ton). Two hydroelectric steering motors developed 70hp each. Fuel oil bunker capacity was 2,629 tons ("County" cIass: 3,400 tons), occupying 2,887.8m³ (101,981ft.³ or 762,934 gals.). Diesel fuel totaled 127.4 tons or 144.2m³ (38,094 gals.). Twenty tons of lubricating oil and 8.5 tons of gasoline (for boats and aircraft) were provided for. Feed water totaled 232.98 tons (61,555 gals.) and was allocated as follows: feed water 27.3m³, reserve feed water 164m³, and surplus feed water 41.7m³. 8-203mm (8in.) guns paired in 4 turrets. 4-120mm (4.7in.) LA (surface) guns in single open mounts. 4-120mm (4.7in.) HA (AA) guns in single open mounts. 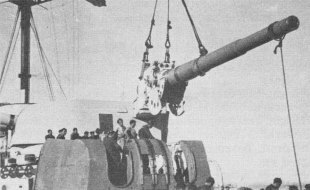 8-40mm AA guns in double open mounts. 12-533mm (21in.) torpedo tubes in 4 triple mounts. The rapid evolution of military aircraft caused a reevaluation of anti-aircraft defense while the ships were yet on the ways, resulting in the elimination of the LA 120mm guns in favor of a total of 8 HA 120mm weapons. For its day, this was considered good air defense. Five 90cm searchlights and two observation/scouting aircraft were to complement the weaponry. The catapult, and thus the aircraft, never arrived. Main battery fire control equipment was to have come from Vickers in Britain, and that for the secondary armament from Holland. None of this vital equipment had arrived by the outbreak of the Spanish Civil War, and the British and Dutch governments, in accordance with the Non-Intervention Agreement, refused to permit their export. The main battery consisted of 8 Spanish-built Vickers, 1924 model, 203.21mm (8in.) 50 caliber rifles. Their muzzle velocity was 840m/sec. with a maximum range of 16 miles. The rate of fire of the 113kg (2491lb.) projectiles was 6 rounds per minute. After firing fifty rounds the guns would have to be aIlowed to cool. These guns met the British Admiralty requirement that all guns be dual purpose, and so had an elevation of 70°. The anti-aircraft capability of such heavy, slow weapons with inadequate fire control and unsuitable fuzes for fast moving air targets was minimal. The mechanisms of the main battery guns were needlessly complicated to attain an unnecessary elevation. The magazine capacity was 60 rounds per barrel, ready service ammunition being in addition. At the end of her career the total capacity was rated as 1,200 rounds. The final design caIled for a secondary battery of 8 Spanish Vickers, 1923 model, dual purpose 120mm (4.7in. ), 45 caliber guns evenly spaced in single open mounts, four to a side. Maximum elevation was 80°. Muzzle velocity was 825m/sec, the maximum range 8.5 miles, and the rate of fire 9 rounds per minute. The projectile weighed 22kg (48.5Ibs.). Four hoists served these guns from magazines forward and amidships, the total capacity being 100 rounds per gun. Later ratings listed a 4,000-round total. The eight-40mm AA guns were also a Spanish Vickers model, but they were being manufactured in territory occupied by the enemy in 1936 and so, as with the machine guns, never came to be mounted. The triple torpedo tube mounts were installed on the main [US:2nd] deck just forward of the after turret barbettes and fired through ports in the side. Two depth charge mortars and a stem rack were fitted aft. Canarias in wartime rig, 1937-39. The dark funnel band is for recognition purposes. The imperial Spanish eagle adorns turret 2. Her 120mm guns all are still in place. Photograph from Moreno, La guerra en el Mar; print from the C. W. Beilstein Collection. Interior communications incIuded a loudspeaker system, a network of 117 telephones, and a pneumatic tube message system. Some 170.8 tons of fresh water served the needs of the crew, with electric water heaters for officer spaces and steam water heaters for the crew. In winter, officer country enjoyed hydro-electric radiators, while warm air blowers heated the rest of the ship. An additional 10 Carley floats had a capacity of 230 men. In later years 6 further rowing boats were added to this general allotment. This aerial shot of Canarias at speed gives a good idea of hull shape. She wears Civil War markings: funnel band and St. Andrew's cross on turrets two and three. Photo: Gabinete Fotográfico, Ministerio de Marina [GF]. The Canarias class featured three 3.5 ton stockless anchors, two on the starboard and one on the port side. 1. "El último adiós al Canarias", Revista General de Marina, 190 (February 1976), 199-203. 2. In that very summer, the British Admiralty was in the process of deciding in favor of vertical over raked funnels and masts. A vertical arrangement made it more difficult for an enemy to judge course and speed. It also facilitated the placement of aircraft, boats, and derricks. See I. A. Sturton, "H.M.S. Surrey and Northumberland," Warship lnternational, 14 (3, 1977), 246. 3. A simplified plan of the original design is in Jane's Fighting Ships, 1930, 418. 4. See the excellent, discussion in Sturton's article. 5. Particularly good among many fine discussions of Spanish strategy are Vice Admiral Juan Cervera Valderrama, "La defensa nacional," Revista General de Marina, 117 (October 1935), 501-516; and Lieutenant Commander Arturo Génova, "Cruceros, convoyes y submarinos," Ibid, 114 (May 1934), 609.634. 6. Spanish cruisers under the Republic were República (5,590 tons), Méndez Núñez and Blas de Lezo (4,780 tons), Libertad, Almirante Cervera, and Miguel de Cervantes (7,975 tons), and the two new heavies. Libertad was the former Príncipe Alfonso. 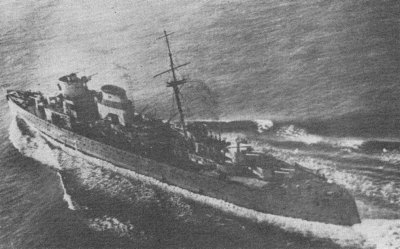 Blas de Lezo wrecked on a rock in 1932. 7. For many years Jane's erroneously reported only 2 shafts. This and other annuals have perpetuated many errors. 8. Jane's Fighting Ships, 1966-1967, 233. Reports vary. Flottes de Combat, 1958 reported the radius as 10,000 miles at 12 kts, 5,000 at 25, 3,750 at 30, and 2,350 at 32. A. D. Baker received 1970 figures of 8,000 at 10, 6,660 at 15, and 2,550 at a maximum of 31.5 kts. 9. Jane's differs from the official figures. Jane's for 1939 lists 765, for 1953-54 1,042, 1962-63 948, 1968-69 1,022, and 1971-72 1,000. Weyers 1963 lists 1,042, and 1973 1,020. A. D. Baker received a 1970 total of 927 men. Any comments about this article? Click here.